The U.S. consumer is widely known to be the major contributor to domestic economic activity. In fact, the American consumer’s share of the U.S. economy (over 68%) ranks among the highest in the world. Though the consumer and the labor market have been fragile during much of this recovery, consumption has remained relatively strong (although it has been weaker than during other recoveries) despite low payroll and meager wage growth. In 2015, consumption kept GDP growth in positive territory—can the consumer continue to pull the economy forward, or is economic growth at risk of stalling without an improvement in government and investment spending? There are several factors, both secular and cyclical, to consider when analyzing the consumer, including their financial health, their willingness to spend, demographics, and labor market dynamics. We believe that secular factors suggest an ongoing slow-growth trajectory for the foreseeable future, though some cyclical forces offer potential modest tailwinds in the coming quarters. The consumer’s balance sheet has returned to much healthier levels. The debt service ratio has fallen to all-time lows, and consumer credit has begun to recover without expanding to worrisome levels. Mortgage debt turned positive in 2015 for the first time since the recession. Credit card limits and balances are increasing, again suggesting that consumers may once again be willing to take on debt. This is positive for consumption growth as long as consumers continue to borrow responsibly and delinquencies remain low. These signs of a healthier consumer willing to take on debt should bode well for consumer spending going forward, as debt growth is an important part of consumer spending growth. However, consumers have increased savings recently as well. While this is a positive for future spending, it is a negative for current consumption growth. The personal savings rate has been in a downward trend since the 1970s. Could this trend be reversing? Surveys on consumer spending versus savings have shown mixed results. Therefore, this is a trend we will be closely monitoring. A sustained shift toward a preference for saving would be a negative for spending growth, at least in the near-term. For much of the recovery, payroll and wage growth remained subdued in comparison to previous cycles. Growth in payrolls finally began strengthening in mid-2014, and wage growth began to pick up in early to mid-2015. Recently, government hiring has turned positive, relieving another headwind to employment growth. Furthermore, the overall labor supply picture has tightened as the Baby Boomer generation continues to retire. 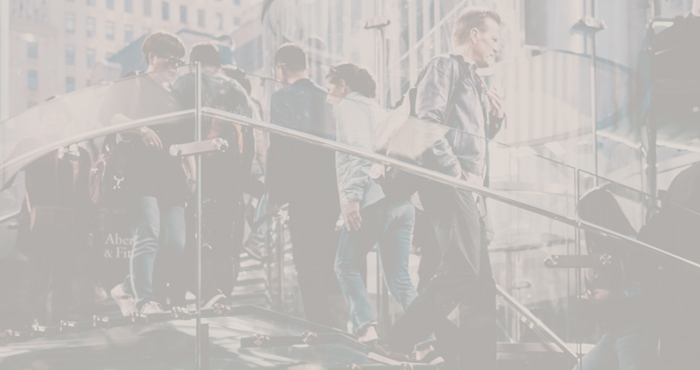 It is estimated that today approximately 90,000 to 155,000 new jobs are needed each month to keep pace with population growth1. Payroll gains have consistently come in above this threshold since 2012, suggesting that additional workers have been pulled back into the labor force. As labor market slack continues to be taken up, the economy will eventually reach the point where companies must compete with one another to retain and recruit employees, and wages will therefore increase. The wage picture had been mixed until recently, with some areas tighter than others. Skilled labor began to show wage growth before many other areas of the labor market. Manufacturing has seen strong wage growth recently despite relatively benign growth in manufacturing activity. This is largely due to the skills gap, which shows up in the very low number of unemployed experienced manufacturers. While the availability of experienced workers in the overall labor market recently has risen slightly, it has declined notably over a longer period. Meaningful, broad-based wage growth is starting to materialize, suggesting we may have reached the point where the labor market has little excess supply left. 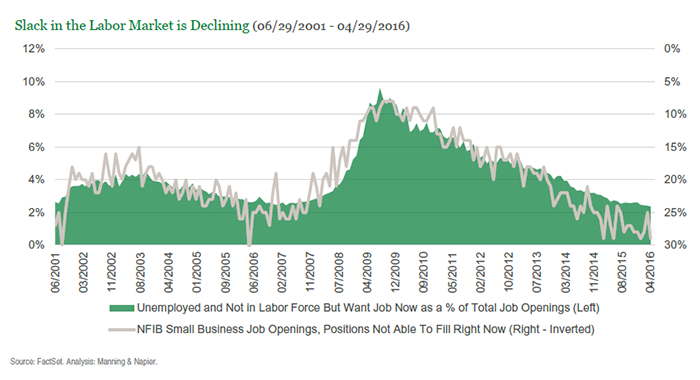 Even accounting for those outside the labor force who want a job, slack remains extremely low and job openings remain near pre-recession highs. Average hourly earnings have been trending higher since 2015, and metrics such as the median wage tracker put out by the Atlanta Fed are showing even stronger wage growth. Adjusting for flows into and out of the labor market by isolating prime-age workers illustrates even stronger growth. Nevertheless, the charts below also show there was an extended period of time without meaningful wage growth. Despite the improvements in wage growth, we are monitoring a few data series that are signaling the labor market may be beginning to turn over. Specifically, temporary payrolls, which are provisional workers that are typically the first to be let go, look like they may have topped out, and small business optimism, in particular concerns over poor sales, has moved into somewhat concerning territory. We will continue to monitor labor market and wage indicators for continued strength or further weakness, as this will have large implications on consumer spending going forward. However, at this point in time we believe that wage growth will continue to strengthen given the limited amount of slack in the labor market. 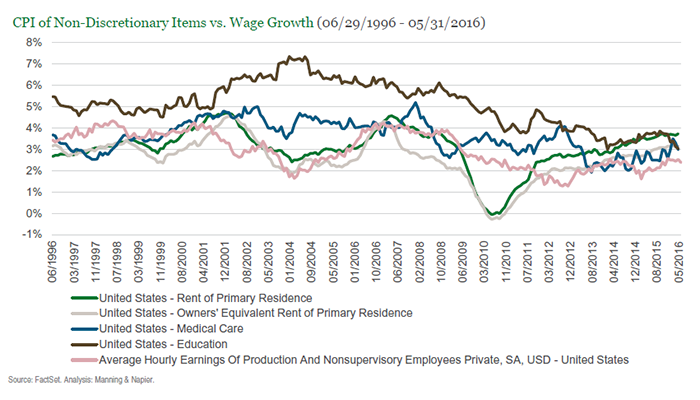 While payrolls have improved and incomes have grown in aggregate, for most of the recovery average hourly earnings for production and non-supervisory workers have grown at a rate below the growth in prices of many non-discretionary items. These non-discretionary purchases include food, healthcare, housing, and education. Therefore, households’ ability to make discretionary purchases has been limited. This is especially consequential for those not near the top of the income distribution, where non-discretionary purchases take up a much larger portion of their paychecks. The average expenditures and wage growth by income quintile is skewed because many of the people in the lower quintiles of income are retired, and therefore will not see wage growth. For example, 45% in the lowest quintile of income do not work. More people retiring also drags down the medians and averages of these quintiles, making it look like they are experiencing a decrease in wage growth. Despite the skewed calculation, from a pure GDP standpoint, the top 40% of income accounts for 62% of consumption expenditures, so that is what really drives consumption growth. Those who have a household income of $50,000 or more, approximately the top two quintiles of income, have had the highest level of consumer confidence throughout this recovery, which may explain why consumption has held up so well despite lackluster wage growth. Those making $25,000 to $50,000 saw improved consumer confidence in 2013 and 2014, and it has stayed relatively steady since then, which hopefully will bode well for consumer spending going forward. 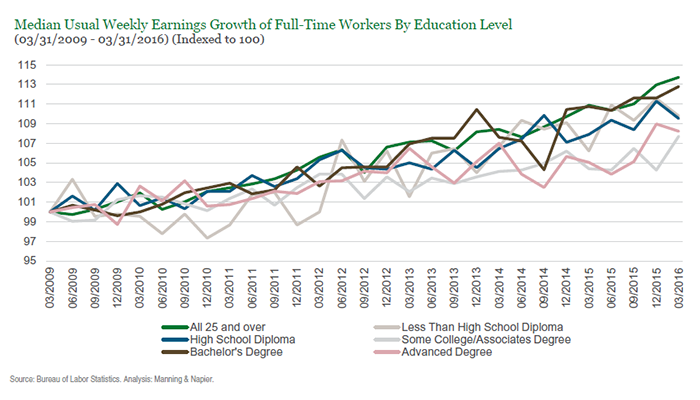 Looking at the chart below, this time period coincides with when those with a high school degree and less started seeing earnings growth. Increased consumption spending from lower and middle income households has the potential to provide an additional boost to overall spending should wage growth continue. Favorable demographic dynamics created by the maturation of the Baby Boomers were a strong tailwind for consumption growth for much of the 1980s, 1990s, and 2000s. That generation, however, is now retiring, which on net turns a driver of growth into a potential headwind. It is important to understand the prior contributions from demographic tailwinds as well as the future impacts that these issues will have on consumption growth. (For reference, in December 2012, we published an article titled “Potential Macroeconomic Consequences of an Aging Population with Insufficient Savings.”) This remains an important issue today and will continue to be a headwind for the foreseeable future. 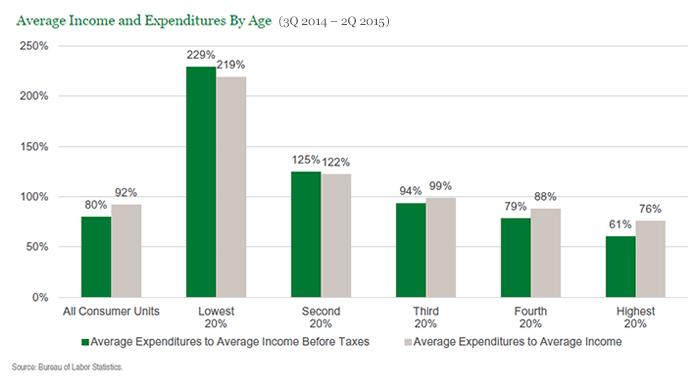 Spending on most categories decreases with age, but for the Baby Boomers the decline may be even more pronounced due to generally insufficient retirement savings. The Echo Boom generation (those born in the 1980s and 1990s) does offer some hope for an offset to the retirement of the Baby Boomers. 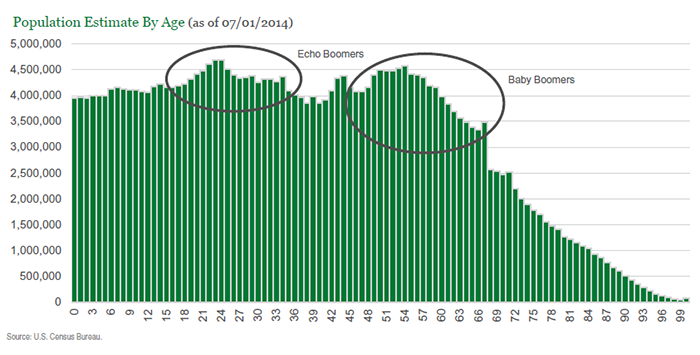 The Echo Boom is actually larger in number than the Baby Boomer generation. The front edge of the Echo Boom generation is 36-years old, and the growth in spending that occurs between the 25-34 and 35-44 cohorts is notable. They are moving into a cohort of spending and earning that is higher than the cohort the Baby Boomers are moving out of. In isolation, Echo Boomers making this transition to higher spending and earning years is very positive for consumption. Unfortunately, things rarely exist in isolation. The impact of demographics on consumer spending extends well beyond just population math. It also incorporates patterns of behavior and shifts in preferences among various groups. In the case of the Echo Boom generation, this entails changes with regard to decisions about debt, savings, and household formation. Many in this generation are facing elevated student loan debt burdens, which likely will delay their transition to peak spending years. Changing attitudes toward debt and savings could also influence the spending patterns of this generation. In the Gallup poll referenced earlier, ages 18-29 from 2001-2006 showed the lowest preference to save (43%), but now show the highest preference to save (66%). This preference could be a permanent characteristic of the Echo Boomers, meaning as they enter their prime spending years the economy does not see as large of a boost from this age cohort. One trend that has evolved among the Echo Boom generation is a tendency to live at home with their parents further into adulthood. This has come at a time when the rate of household formations has slowed meaningfully versus history. The average percentage of 18-34 year olds living with their parents from 1983-2006 was 27.6%. Today, 31.6% of 18-34 year olds live with their parents instead of building their own households. 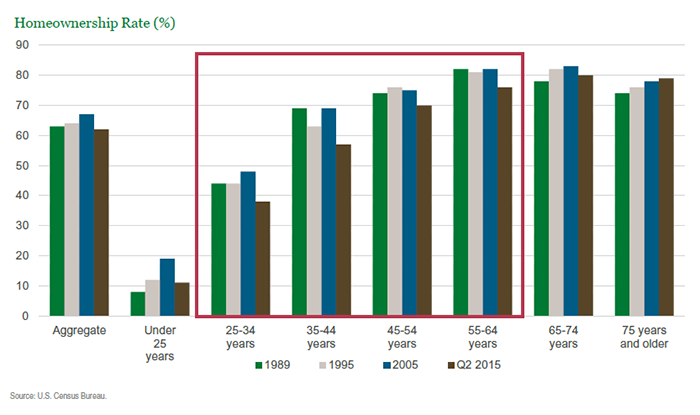 Homeownership rates for households where the head is aged 25-34 have fallen from a peak of 50% in 2006 to 38% today. The average homeownership rate for those households headed by an individual aged 25-34 from 1989-2005 was 45%. A return to the historical average homeownership rate for those households headed by a person 25-34 would require more homes than the 1.3 million for sale today. Shockingly, this is only one age cohort. Those households headed by people 35-64 are also below their long-term historical average in terms of homeownership rates. This also does not account for all of those 18-34 year olds that are living with their parents and haven’t even formed their own household yet. If people begin to buy homes again at a meaningful pace—moving back toward the long-term homeownership rate—many homes would likely need to be built. Newly built homes impact GDP much more than existing home sales, and are captured under investment spending as residential fixed investment. The dynamics of today’s mortgage market are different from previous cycles. Due in part to the financial crisis, older borrowers with higher credit scores now owe more of the debt, and older borrowers are now more willing to borrow than they have been historically. While we will never get back to housing bubble type borrowing (a good thing), the mortgage market is becoming healthier and the willingness and ability to borrow is coming back. The third quarter of 2015 marked the lowest number of individuals receiving new foreclosure notices in 16 years2. Lending has remained reasonable, and standards are beginning to lower as more people with credit scores below 719 get loans. Mortgage rates have decreased, and the cost of homeownership relative to income for first-time buyers has improved. At the same time, rents have continued to increase. However, banks are continuing to require sizeable down payments, which are difficult for Echo Boomers to come up with. Some banks are beginning to put together plans to loan on smaller down payments without requiring mortgage insurance. This slow loosening on the credit side has happened while mortgage applications have begun to improve. This all is promising for the housing market, and the hope is that the homeownership rate can at least increase back toward its long-term average for many of these cohorts. A number of factors—including loosening lending standards, improved sentiment around real estate, and rising rents—are conspiring to create a nice setup for a continued improvement in housing. At the same time, there is a limited amount of rental and housing inventory today. Even if improved market dynamics result in more existing homes hitting the market for sale, new homes likely will need to be built. This is illustrated by the 2.2 million homes needed to get just the 25-34 cohort back to the long-term homeownership average. While this is likely to be a slow process given that student debt and the Great Recession have put this cohort behind on earnings and household formations, there are other age cohorts that can start the movement back toward homeownership. This is worth monitoring, as housing has lagged almost every other part of the economy this cycle. A rebound in housing could be a very positive boost to economic growth. The consumer spent the first several years of this economic expansion recovering from the fallout of the housing bust and the most severe recession since the Great Depression. This included a large scale financial retrenchment of both the voluntary and involuntary (i.e., foreclosures and bankruptcy) varieties. With most of this retrenchment in the rear-view mirror, the outlook for the future shifts toward a combination of cyclical and secular factors. Secular factors such as demographics primarily shape the longer-term trajectory of growth, while cyclical elements such as wage growth and labor market activity drive the ebbs and flows of activity around this path. In our estimation, the secular factors suggest an ongoing slow-growth trajectory for consumption. The transition of the Echo Boom generation toward their peak spending years will help offset the impact of their parents (i.e., the Baby Boomers) moving further into the retirement phase. However, factors such as elevated student loan debt and potentially changing attitudes toward spending versus saving following the Great Recession may delay and/or diminish their contribution to overall consumption growth. Cyclical factors offer some potential tailwinds in the coming quarters, particularly if the labor market remains firm and further wage growth materializes. Housing also offers some potential tailwinds to consumption to the degree that the household formation trend improves and homeownership rises. Today, however, we continue to maintain our slow-growth outlook for both the U.S. consumer and the economy as a whole, but are closely monitoring these factors and others for evidence that may warrant a change in this view. 1The 155,000 is overstated at least slightly as it includes 15-19 year olds whose labor force participation rate is ~35%, and 65-69 year olds whose labor force participation rate is ~33%. The 90,000 is also at least slightly overstated as it includes those 15-19 year olds as well.